A Nomad… A Gypsy… A Military Brat. Travel is the only “Home” I know. I’ve had the privilege of experiencing some great travel adventures because of my work as a TV news photographer. The flight of the Concorde is my absolute favorite. Since April, 2014 I’ve been a contributing writer of the “Wino” column for City Weekend Magazine in Shanghai and Beijing. Two articles are published each month. If you grew up in the 1950’s, you were probably glued to the TV during the many Westerns that filled the afternoon hours. Many years later, I met Roy and Dale at their home. 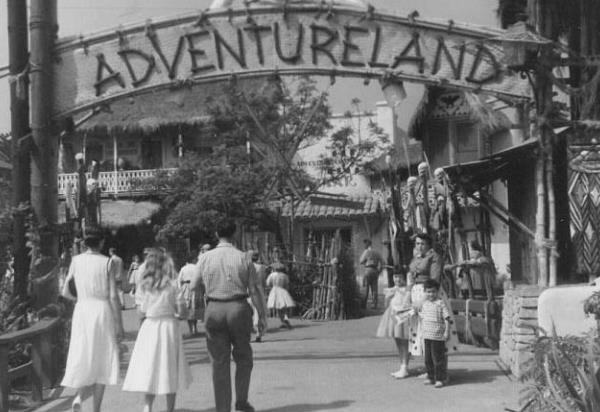 Disneyland opened in 1955 and became every child’s dream trip. We had our dream fulfilled a few months after the park opened, and it was everything we could have imagined. Born at Letterman Army Hospital. I never actually lived in San Francisco. It’s not my home town, but then, I don’t have one. I’m a nomad…a gypsy…an Army Brat. Put me on an airplane, send me anywhere. That’s where I belong…anywhere. I’ve lived in China since 2011. But I prefer being on a 747 to…well…you name it. I graduated from Pleasant Hill High School in Northern California in 1969. The school no longer exists. Kind of fits don’t you think? I’m fortunate. My career as a TV Photojournalist has sent me around the world frequently. I’ve traveled to 48 US States, and visited 40 countries, some of them multiple times. My earliest memories are of Japan. I was 3 to 4 years old when we lived in Yokohama, but the sights, smells, and people were so different they left an indelible impression on my sprouting brain. It was normal for us (and most military families) to move every 1 to 3 years. Many were transferred every 6 months! That has its good and bad points. The good is that you always get to see new places, learn about foreign cultures (Texas is quite foreign), and experience things which most people never have the opportunity. The bad is that you make friends fast…and lose them even faster. That’s why I created the Military Brats Registry in 1997. I wanted to find my friends and I knew that thousands of other Military Brats wanted to do the same. I spent Kindergarten through third grade in 2 schools, one in Concord, CA and the other in El Paso, Texas. Then we moved on base at Fort Bliss, TX in 1960. This was my first school on a military base. I remember showing up for the first day of fourth grade. It was always hard to be the ‘new kid’ in the class. But this time was different. Since everyone else was a Military Brat, they all knew what it was like to be the new kid, and I was accepted right away. That year and a half provided some great memories. I began searching for my friends from Bliss Elementary sometime around 1990. It wasn’t easy to do since the Internet wasn’t accessible at the time. When I started the Registry, I set up a page called “Marc’s Personal Search.” It took 9 months before the first former classmate found the site and contacted me. Since then, I have located 13 of them! During high school and college I began my career in broadcasting at KDFM radio in Walnut Creek, CA. It wasn’t long before I found out I had a natural gift as a cameraman (my professors said so!). In 1972 I moved to Hollywood to get into “big time television.” It was a struggle, but an enjoyable one. I shot the first commercial for the “Chia Pet” and said “It’ll never sell.” My stock market advice is equally as good. || Warnings From Gangland (1984-85) A Los Angeles gang attacks a grocer and his family who fight back with the aid of the police and the courts. 58 minutes. Broadcast “Frontline”, PBS. || Shootout on Imperial Highway (1984-85) Los Angeles gang goes to jail where its members tell their side of their war with a grocer, his family and the police, all of whom meet again in a Los Angeles courtroom. 58 minutes. Broadcast “Frontline,” PBS. ||For Auction, An American Hero|| For Auction: An American Hero (1985-86) Auctioneer travels Nebraska disposing of farms, farmers and one of America’s great traditions. 58 minutes. Broadcast PBS. duPont/Columbia Award; Best Documentary. Emmy Nomination. Nyon Festival; Special Recognition. Cine Golden Eagle. || Your Flight is Cancelled (1988-89) World’s busiest airport when a thunderstorm strikes. 45 minutes. Broadcast “Frontline,” PBS. Emmy Nomination, ’88. || L.A. Champions (1994) High school basketball captains are celebrated as they contest for the championship, then graduate into lawless, jobless streets of South Central L.A. 58 Minutes. Funded CPB Broadcast PBS. || (2010) “Protect Kashgar” is about the Chinese government’s project to save an ancient city and its people from the possibility of a disastrous earthquake. || (2015) ““GLF Tea USA“. While living in China I became fascinated with tea. I learned about white tea, which is truly the healthiest of all teas. Along with Mark Williams, I co-produced and starred in a 30-minute infomercial that educates and entertains the viewers about this beneficial drink. You can watch the video in the gallery at GLFTeaUSA.com. We often look, but we seldom see. The “Art of Seeing” is what puts certain photographers into the category “artist.” These people have developed an almost sixth- sense about places, objects, people…and events. The untrained eye misses these little vignettes of the world, but the artist-photographer finds beauty and enigma in the commonplace, unusual in the usual, and meaning in the apparently meaningless. Here is a look at some of my travels. Keeping up with the schedule here was too much of a chore (aka: lazy). In the most recent times I’ve traveled all over China, Vietnam, Philippines, Singapore, and will continue to travel as long as I am able! There was more, but I was too lazy to update the site!